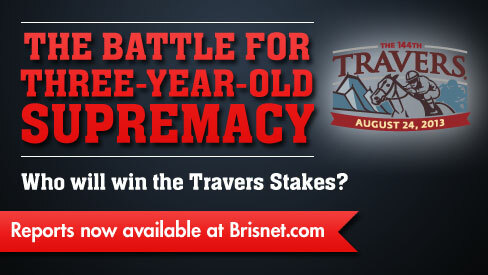 The winner of this year's Travers Stakes has a good chance to become the first champion three-year-old male to win the midsummer classic since Summer Bird in 2009 and just the second in the past seven years, third in the past 12, and fourth in the past 18. Of course, it could be like 2007 when Street Sense became just the first Kentucky Derby winner to take the Travers since Thunder Gulch in 1995, but Street Sense ended up more like Sea Hero, who despite completing the rare Derby-Travers double, failed to earn the Eclipse Award as champion three-year-old male. Street Sense lost out to Curlin, who completed his season with a Jockey Club Gold Cup-Breeders' Cup Classic double, and Sea Hero somehow lost out to the late Prairie Bayou. One of those two scenarios is very likely to play out the remainder of the year. If one of the Grade 1 winners entered in this year's Travers (Orb, Palace Malice, and Verrazano) were to win the race, then he would unquestionably be the leader in the three-year-old division, and it would take a Curlin-like run at the end of the year for either of the also rans to catch up. 1. Orb--Sure, his Triple Crown season following his sloppy Kentucky Derby win was less than stellar, but he did earn blacktype in the Belmont Stakes, which makes him just the second horse in the past nine years to do so (Mine That Bird was the other). No question he lost ground in the standings with his Preakness dud and non-threatening Belmont run, but two Grade 1 wins--including the biggest of all with the Derby--has him as head of the class. A Travers win or a loss by Verrazano & Palace Malice keeps him here. 2. Palace Malice--I typically value Grade 1 wins over anything, but classic wins along with select Breeders' Cup races are essentially super Grade 1s in an era of too graded races to begin with. That's a long-winded way of saying Palace Malice's Belmont Stakes win means more to me than Verrazano's Wood and Haskell combined. Palace Malice also finished second in the Blue Grass on Polytrack and looked good in the Jim Dandy. A Travers win unquestionably moves him to the head of the class. 3. Verrazano--Hard to imagine a colt with this much talent is third on any list, and if Oxbow were still around he might even be fourth, but the top spot is easily within reach, as a Travers win would make Verrazano this year's only three-time Grade 1 winner in his division (a distinction Princess of Sylmar has already achieved in her division). A Travers win would also answer the pesky 1 1/4 miles question and probably set him up as the favorite not only for the Breeders' Cup Classic but also Horse of the Year and one heck of an exciting stallion prospect. 4. The others--A Travers win would get any of the other horses into the conversation as a top three-year-old, but other wins would be necessary to usurp the classic winners from the top spot. From a Horse of the Year perspective, a Breeders' Cup Classic win seems almost a must considering who is pointing for that race and Wise Dan has a big shot at 5 Grade 1 wins by the end of the year (albeit at 1-1 1/8 miles on the turf). In the video below, Triple Crown Insider takes a look at the Travers and all its implications, and Joel Cunningham and I agree on who will win the race.